How can I include e.g. my blog's content on my wall? Is WordPress supported? Can my wall be exported as RSS and why is this useful? 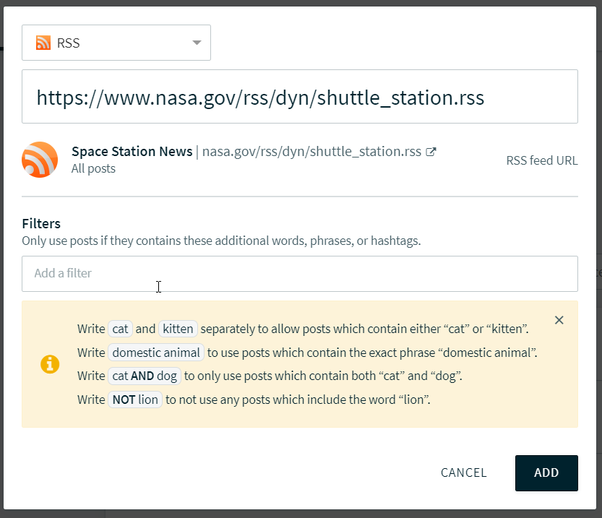 There’s an easy way to get your website’s / blog’s / podcast’s content onto your Social Wall: if you syndicate it with a standard RSS/ATOM-Feed, you’re good to go. 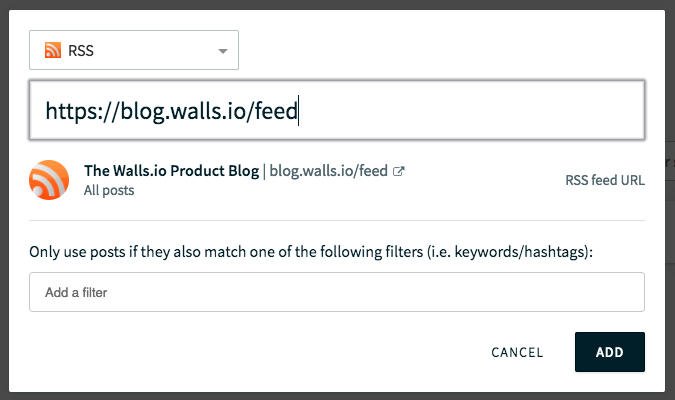 To add an RSS feed to your Walls.io social wall, just go to Settings > Sources and choose RSS from the social media sources drop-down, paste your RSS feed URL and add filters if you need to. 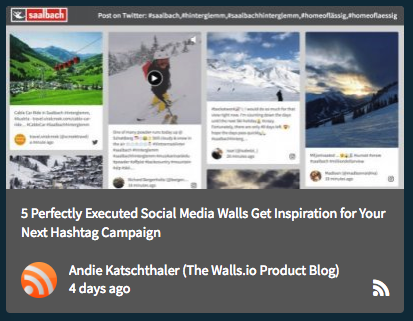 All paid Walls.io plans offer the ability to include RSS feeds in your channel settings: Just copy/paste the URL to your feed, add it as a Source of type RSS in your Wall’s settings and a minute later current blog posts will appear on your wall. The limit of “sources per social network” defines how many different feeds you can add to your Wall – check our feature matrix for details. Not sure what the URL of your feed is? Normally, it’s the domain of your blog followed by “/feed” (e.g. blog.walls.io/feed) or “/rss” (e.g. blog.walls.io/rss). When adding RSS sources to your wall, Walls.io will usually only display posts that aren’t older than 24 hours, but you can use the “Moderate” feature to show older posts as well. Which content does Walls.io import from your feed? Since WordPress doesn’t use <enclosure>-Tags in the feeds it generates, we built in the ability to infer images for your articles from their Open Graph tags. Whenever the tag og:image is set for a post, Walls.io will automatically import and display this image. You can use the Jetpack plugin to generate Open Graph tags for your articles in WordPress easily. You can include the feed we generate through our API in third party services like IFTTT or Zapier. Using those services, you can automate how new content appearing on your Wall is processed in many ways. The possibilities are just about endless here.